(who needs to do what that hasn't been recorded in a bug) We should assign people to the open items. http://weblogs.mozillazine.org/seamonkey/ has not been updated since November 2012, the last version listed is 2.14 (bug 956561); move blog to blog.mozilla.org if possible Assigned: mcsmurf. Mcsmurf says that it looks like we might be getting a blog on blog.mozilla.com. Ratty managed to get Kerz's contact address but totally forgot to follow this up. FAIL. New breakage: bug 983536 libpango version >= 1.22.0 required on Linux. bug 977676 SeaMonkey's puppet broken due to requirement of ffxbld ldap password. Python has been updated on all buildboxen! Windows en-US builds are being successfully compiled but tests are not working due to a dependency on python 2.7.3.
bug 908090 ImportError: No module named json, on SeaMonkey Linux/Windows (all) test runs, due to (still) using Python 2.5. We do have python 2.7 installed but our build system is picking up python 2.5 instead. ewong's patch is waiting for review. It was manually patched on the master; but, was reverted and the buildmaster was reconfigured and so the changes are gone. Need to have the patch pushed officially in order for this bug to be fixed. pymake is failing with "invalid syntax" again because of an outdated Python. No langpacks since 29th August on trunk. Needs investigating. Windows and Mac trunk langpacks directories have been removed on the FTP server, maybe for lack of recent XPIs (later than 2.20a1). Latest Linux langpacks are dated 29 August. Callek told Tonymec on IRC he has a hunch about why but more pressing things to do first. In Bug 902876 Comment 12 Mcsmurf is waiting for feedback from the build team on how to proceed. Buildmaster is up and running. Callek is hand-approving requests for CLOSED TREE landings at the moment. Due to the master having some mysql issues, Callek has put a halt on the mysql updates, which affects the tbpl. So nothing is showing in tbpl atm. comm-* will be building out of mozilla-* (bug 648979 etc.). Jcrammer has mostly completed the coding. Next step is consultation with mozilla-central build peers on landing the patches and also getting implicit permission to add several new top level directories to mozilla-central. We managed to get two betas out in the last two weeks. SeaMonkey 2.25 beta 2 was released on March 9. SeaMonkey 2.25 beta 3 was released on March 14. SeaMonkey 2.25 final is scheduled for March 19. See Basics page. Please only list current changes here. bug 798174 (DOMi2.0.15) DOM Inspector 2.0.15. Mcsmurf asked crusell how he did the releases. https://wiki.mozilla.org/DOM_Inspector/Releases/Checklist. IanN says he may take a look at doing this, time permitting. InvisibleSmiley says we should link to https://developer.mozilla.org/en-US/docs/Mozilla/Calendar/Calendar_Versions#Stable_Releases. But without direct links because that would then require us to update any links in case the Calendar team releases bugfix releases. This is now bug 984884 (Update release notes how users can find the current Lightning version for SeaMonkey). See Basics page for the usual reminders. Note: Please file bugs if you notice any landing on mozilla-central that might break us. Please don't depend on Ratty noticing such landings. bug 943732 Port the new Character Encoding menu to SeaMonkey. Our front end Sync UI needs to be updated as the old backend is going away in Gecko/Firefox 31. See: New Firefox Sync has landed in Firefox Nightly. A lot of these bugs are due to mozilla-central switching from synchronous APIs to Asynchronous APIs. bug 909093 Update SeaMonkey to use nsIContentPrefService2. Mcsmurf and Neil@parkway are currently working on this. bug 912031 Use Asynchronous FormHistory.jsm in place of nsIFormHistory2 in Suite. MailNews bug 791645 Rewrite calls to synchronous nsIProtocolProxyService::DeprecatedBlockingResolve with Async code before DeprecatedBlockingResolve disappears as well. bug 795354 Migrate SeaMonkey Linux builders to CentOS 6.
bug 794772 Port |bug 713802 Build with GIO support (and drop GnomeVFS)|. This is dependent on bug 795354.
porting bug needed for the two configure.in changesets? Changes could be folded into bug 794772 above. *** IanN and Ewong are looking into this..
bug 882036 Port GTK2 to GTK3 - SeaMonkey Part. A Red Hat person seems to be working on the GTK3 integration. bug 896947 Use asynchronous version of setCharsetForURI and getCharsetForURI in getShortcutOrURI and other places. Not necessarily Good First Bugs but minor fixes that shouldn't need advanced coding skills. bug 795002 Improve detection of valid feed urls in messengerdnd.js (Port relevant bits of bug 737115). Bug statistics for the last two (full) weeks: 19 new, 9 fixed, 11 triaged. See Feature List page for major wanted/needed features. New: We will need to update our Sync UI code due to the new Sync API. Also we need to check if we are allowed to create FX accounts from our UI Since the new Sync accounts are FX accounts. [IanN] I'm sure I saw a question about FX accounts and branding. I am trying to balance the good and the bad points of the original work in the hopes of arriving at something that is an improvement and not just a rote reproduction. At this point I feel like I have a pretty good grasp of the intentions and design guidelines of the original icon designer(s). Please let me know if you or anyone else has concerns about the direction I am going, or nits about the current state of the work. 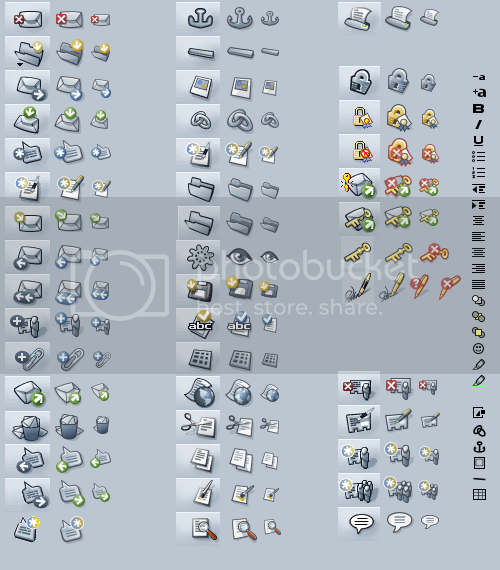 I now have the complete toolbar button set for Modern done in large and small icons sizes. 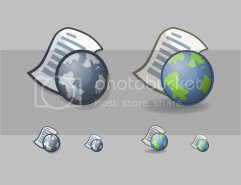 I am now going to start building the secondary icons for each component. Hopefully by the next meeting I will have even more to show you! 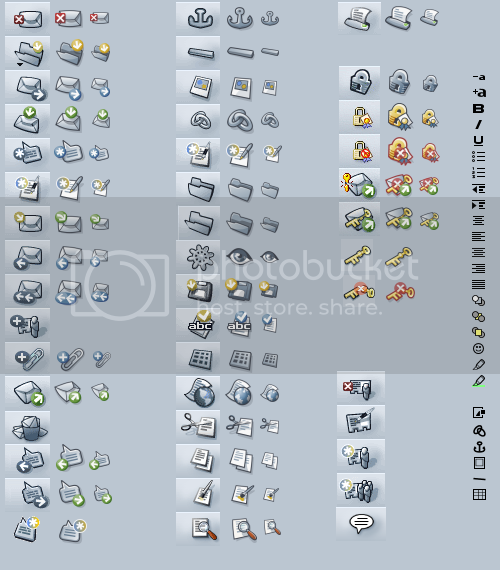 I can mock-up some sample taskbars if you'd like. Status Updates from developers - what are you working on, what's the progress, any other comments? (feel free to add yourself to the list if your name is missing and you have interesting status). bug 957895 - Bug 633937 added unnecessary three strings to messages.properties. Remove them. bug 853720 - After bug 827446, SeaMonkey doesn't know mozcrash. Usual testing, reviewing and commenting. bug 639395 Get cmd_fontSize to reflect current state of selected content / content at caret. Create FAQ for Friends of the Fish Tank. Help get composer standalone builds working with --enable-tests. bug 977048 Close icon only works for click-to-play plugins. This patch will need to be uplifted to comm-beta. Unfortunately I didn't realise that it needed to be uplifted so it missed the release. bug 975362 Support HTTP cache v2 API in the UI. bug 984175 Colour swatches are the wrong size. bug 937407 Autoscroll sometimes leaks an event listener. bug 514280 NS_GET_IID can be used on classes which don't actually declare their own IID. bug 948901 Character encoding menu doesn't work correctly in the FTP directory view. bug 974824 Remove bogus sizetopopup attributes. This patch will need to be uplifted to comm-aurora. bug 909093 Update SeaMonkey to use nsIContentPrefService2. comm-central breakage due to mozilla-central bug 345123 and bug 967364.
bug 973530 Add UI to access the remote debugger preferences. Waiting on dev-tools changes in bug 942756.
bug 980356 Make nsMessengerWinIntegration.cpp compile with frozen linkage. Ready for check-in. bug 984155 Build Thunderbird with frozen linkage / external API - Windows fixes. Has review but needs a new patch because I broke normal builds. Liason with contributor on theme updates. Bug triage and Bug discussions. Usual end user support and PR in newsgroups and Mozillazine. bug 958967 Change mixed content warning default from warn_viewing_mixed to warn_mixed_display_content and remove UI for old preference. bug 960566 Move inline scripts and styles into separate files for SeaMonkey privileged about: pages. Bug triage, testing, and commenting for SeaMonkey and MailNews Core. End-user information and discussion on MozillaZine. bug 957281 Help button should be positioned at the lower end of the preferences window [Toolkit]. bug 973644 Port bug 967970 Set NSDisablePersistence to prevent disk leaks. Daylight Saving Time starts in Europe end of March. We are moving to 12:00 UTC with the April 1 meeting. [Ratty] KaiRo reminded us that we need to grow our contributor community. I'm not sure where we could discuss this. I have no idea on how to do this. Perhaps we can get some Engagement experts from Mozilla to give us some suggestions? [IanN] might have a chat with some people and see if they can point me in the right direction. This page was last modified on 1 April 2014, at 11:33.